I had a wonderful weekend with a lot of cooking and baking but even more eating and drinking. =) Saturday morning, I went over to Jade's to have brunch with her and James. We had been planning this for about two weeks now, and as we were deciding what we would each make and bring, I couldn't believe I had to wait so long for all that deliciousness! Jade made some crepes and had shaved dark chocolate, berries, sliced bananas, lemon juice, powdered sugar, and maple syrup as toppings. James brought homemade blueberry scones with a limoncello glaze and made brown sugar bacon. I brought orange juice, eggs, the potatoes from Boston Organics, and my secret ingredient: duck fat. I'd been reading for a while how good duck fat fries are, so the last couple of times I made duck, I'd been saving the drippings and harvesting the fat that solidifies on top. It's a beautiful thing--almost pure white and apparently, it's healthier than butter! You can store it in the freezer for months on end, and I only bring it out occasionally to make duck fat potatoes. 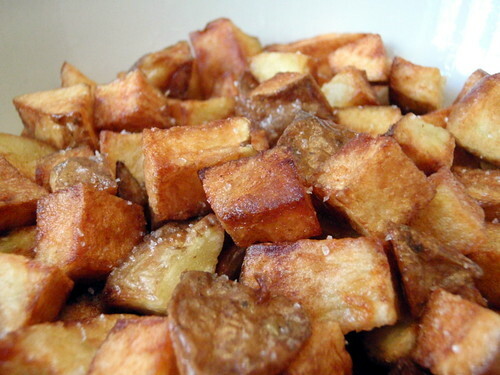 I love potatoes and have tried making home fries in the past but were never 100% pleased with the results. If you didn't add enough oil, they would invariably be almost burnt by the time they were cooked through, but if you add too much oil, it gets too greasy and neve really crispy. 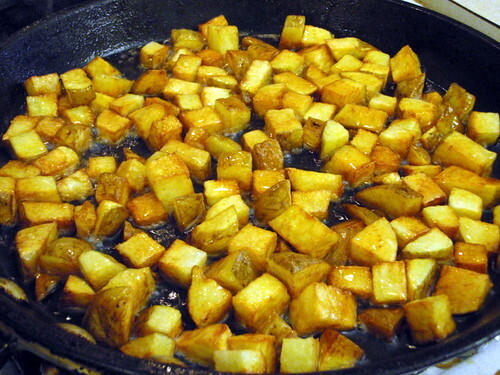 By cooking home fries in duck fat, though, there is some magic that happens where they never get too greasy, turn just the perfect golden brown, and are always crispy on the outside and dry and fluffy on the inside, like a baked potato. And the flavor! It's so indescribably good, I won't even try. Wash and dice the potatoes. I don't usually peel them, but you can if you prefer. 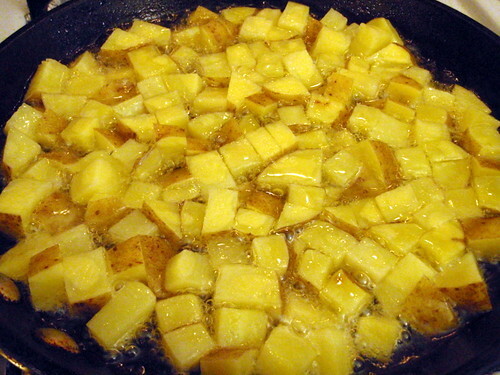 Place the diced potatoes in a bowl of cold, salted water. This is to prevent them from oxidizing (turning brown), to add a little flavor, and also to try to leech out some starch, which would make the potatoes gummy vs. crispy. Drain well after 5 minutes. Heat a large skillet on high and add the duck fat. 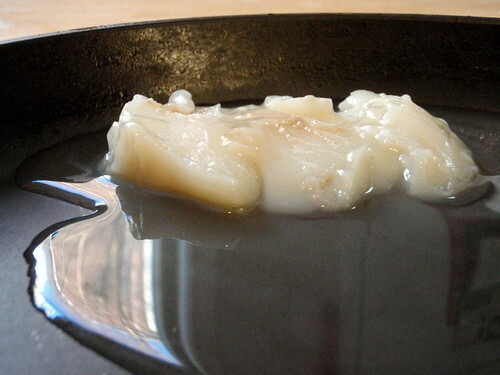 Once the pan and fat are very hot, add the potatoes and form a single layer. 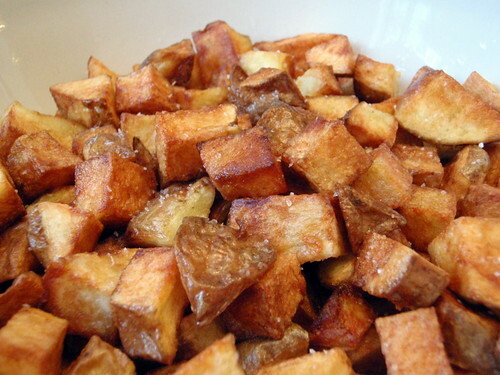 Sprinkle some salt on top and stir every few minutes so that all sides of the potatoes are browned. You could also add a lot more fat so that the potatoes are immersed and essentially deep frying, but I like to hoard my duck fat. Add more salt to taste if necessary and serve hot. If there is any leftover fat in the pan, you can use it to make scrambled eggs, which is what we did, and boy were those heavenly as well. Of course! I'm guessing you'd probably want to deep fry that shape though because it wouldn't be as easy to stir around in a skillet. I've definitely read a bunch of food blog posts about restaurants who serve duck fat fries. Which friend do we have in common? Kristine or Spencer? I made some of these this morning and ate it with bacon, caramelized onions, duck confit and a fried egg... best breakfast EVER! I had a fantastic breakfast of Duck Fat potatoes and eggs this morning. I used a very small dice (1/4") and added onion as well. First I heated the cast iron skillet, then added the duck fat, and finally the potatoes and onion. My what a tasty treat. Very nice blog!!! I love to prepare some recipe with potatoes although i know that a person can gain weight if eat potatoes frequently, but i can´t deny that i really like the flavor, most of all when is combine it with some ingredients. Simply delicous. So when i cook my husband usually is very happy. Actually i was looking information about how to buy viagra but i was entertainment reading this blog.